Metro station “Peremoha” will be completed at the expense of the city budget, stated the mayor Gennady Kernes. Kharkiv was expected for the promised funding from the state budget but the funds did not arrive. The construction of the metro station “Peremoha” does not stop. The city has already allocated 119 million UAH. In order to keep up the speed of construction the city administration is planning to refinance the construction. “It has already allocated 119 million UAH on the construction of the launch area, and it is planned to allocate another 10-15 million for the purchase of equipment and its installation. 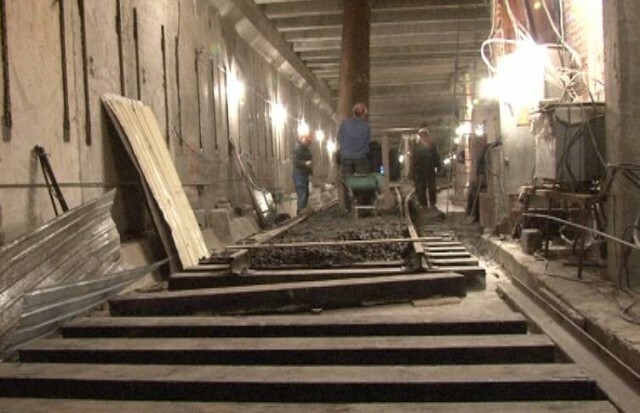 The funds for the construction may be allocated at the earliest sessions of the City Council,” said the Director of “Kharkiv metro construction management” Natalia Linnik. For today the work above ground is almost completed. All constructs of deadlocks where the train will turn are installed and backfilling in progress. Besides, rail centers are being installed in the tunnels. It is made by the Polish technology using special materials which allow remove the vibrations. Gennady Kernes emphasized that Prime Minister of Ukraine Arseniy Yatsenyuk promised to allocate funds for the completion of subway construction during his visit to Kharkiv. The city immediately appealed to the Kharkiv regional state administration, and they appealed to the Cabinet of Ministers of Ukraine but the funds were not received. “I don’t expect to receive funds from the state budget. We received an answer from the Cabinet of Ministers. They returned our request again for correcting. Therefore, we will count on the funds of the local budget but metro station “Peremoha” will be finished. And we will continue to work on new stations in the direction of Odeska street,” said the mayor. Feel free to check the recent post on the topic Kharkiv Metro was find for monopoly. Next articleWho wants to enjoy the advertising?